We are interested in project stories and news from the ice coring community. Please contact us ( nicl.smo@unh.edu ) if you are interested in submitting a story or news item to In-Depth. You may have never heard of it, but one of the world's most important archives on climate change is right here in Colorado. 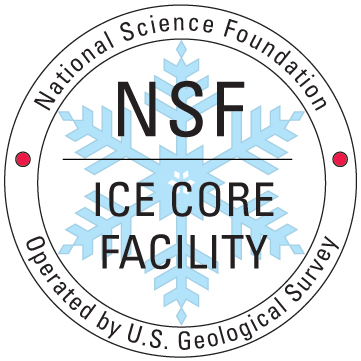 The National Ice Core Laboratory in West Denver holds records on the atmosphere going back hundreds of thousands of years. The data at NICL isn't stored on disks or in books. Inside the freezer, aisles are stacked floor-to-ceiling with silver cylinders about the length of your arm. Each tube holds ice cores recovered from polar regions of the planet. It's -30 degrees Celsius, even though the Sun hangs ceaselessly in the sky. Dressed in puffy, insulated suits and gloves thick enough to both hinder dexterity and preserve fingers, a team gamely tilts a drill barrel back to horizontal. With one smooth, firm motion, a two-meter-long cylinder of ice, bursting with history, is pushed free and slides down a temporary work bench. Inside a huge walk-in freezer in suburban Denver, a college student in a thick parka shoots a jolt of electricity through a yard-long column of ice extracted from Antarctica. Just outside the freezer, in a much warmer room, a computer wired to the ice registers a sudden spike in a jagged red line crawling across the screen. As the winch extracted a two-meter-long cylinder of ancient ice in late December, Murat Aydin looked on. "If we can keep this pace up we should be able to hit 1,600 meters," he said. "This is going to be the deepest ice core drilled at the South Pole by quite a margin." By the end of the project a month later, researchers with the South Pole Ice Core project, known more succinctly as SPICECORE, had exceeded even their most ambitious goals. Immerse yourself in ice: The U.S. Ice Drilling Program's "School of Ice"